So local TV is back on the agenda, offering more questions than answers. In the Guardian Media Talk podcast Matt Wells questioned Jeremy Hunt about the ability to deliver “local” in any meaningful way through broadcast television. TV, in its traditional broadcast sense, is territory based: signals have a “footprint” to which they are broadcast and which they can be received, and that footprint means that there is a hard map of territories and locales which can be served. And those locales do not always make sense to the people who receive the messages. One of the problems with local TV over digital terrestrial, as Wells points out, is that the footprints mean that some large areas that have two distinct identities cannot be served independently. So Manchester and Liverpool cannot receive “local” TV at the same time. Internet technology is seen as affording something much more flexible: both cities could receive local services simultaneously via an IPTV transmission. That’s great but it shows that the problem is always framed by TV-think even by those who can see problems in the system. The question that is answered by IPTV isn’t “what should local news look like?” but “how do we overcome the limitations of radio waves to produce more broadcast footprints?”. This is where the idea of “The Bearwood Question” comes in. Bearwood is a lovely area of the West Midlands that I’ve lived in a number of times. It sits across a local authority border and manages to not quite be Sandwell and not quite Birmingham. When I lived there I looked to Sandwell for local government, and to Birmingham for my cultural and social life. So what does “local media” mean in Bearwood? It’s incredibly subjective. I’m sure some of my neighbours were Black Country diaspora, drifting towards Brum the same way I was drifting out, and their sense of “local” would be very different to my own. Regional media is actually quite good at providing “local media” in this context as it sits across the footprint that encompasses Brum and Sandwell. That means it will deliver everyone in Bearwood a bit of what they need to answer local questions (albeit with a large dollop of things that are of little importance to their locale). Hyperlocal is effective at telling you what is happening on the doorstep, but the space between hyperlocal and regional is complicated, nuanced and personal. And that’s what putting local media online can answer – not “how do we make a broadcast footprint smaller?” but “how do we help people fill their own footprint with media that matter to them?”. This is what my Wi-Fi looks like. Off and on I’ve thought about spending a whole week laptop working in Birmingham’s city centre, to try to get a feel for how well we provide WiFi coverage. And then you know, document it. I kinda don’t need to now. This is a Starbucks “reward” card. Don’t be fooled by the logo they use to sell them to you: they are the old style gift cards. If you have one* you can logon to any Starbucks hotspot you can find. Given the market penetration of Starbucks in UK cities, that’s the nearest thing you’ll get to free universal WiFi coverage**. You’re never more than a foot from a rat, and I’m never more than a yard from a fat pipe. The Starbucks WiFi is actually pretty solid. A lot of the free Wi-Fi hotspots in other cafés in Brum are really slow and unreliable compared to how they were (maybe because so many people are using them now, and asking more of them in terms of bandwidth). As an added bonus, a tall filter (which is the best drink ‘bucks do IMHO) is only a quid making your guilt beverage much cheaper than going into rival stores. You can also double your espresso shot, gratis, or put sugary flavoured crap in your drink, also for no extra charge***. *** evil corporation yadda yadda bored now. I still like Urban Coffee Company more, OK? And I like, totally drink fairtrade. THERE’S FREE INTERNETS FFS! As an online discussion about Birmingham grows longer, the probability of a boundary dispute approaches 1. Over the past two days I’ve taken part in two online games, both played out on Twitter, that have revolved around Brummie culture and geogrpahy. 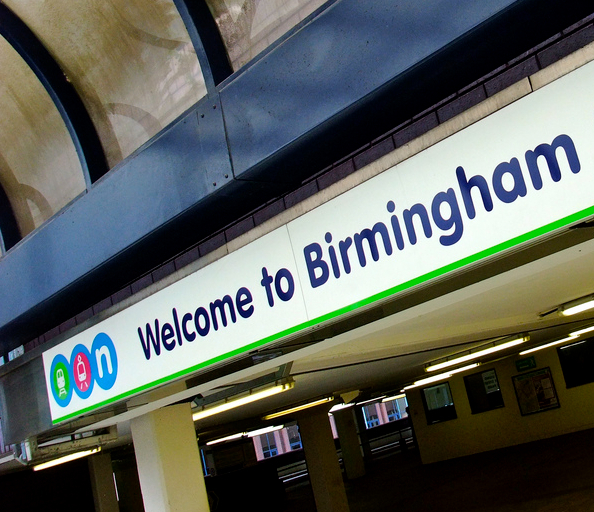 #brumsouvenirs revolved around wordplay on Birmingham place names; the aim to come up with a souvenir idea that reflected the place name (the game was originated by Pete Ashton, who collected the greatest hits on his blog). The second game was #doesntmeanyourbrummie (sic), started as a response to the #doesntmeanyourblack meme (see, the grammar is fine, it’s part of the joke); this tag was about uniquely Brummie experiences. I’ve had similar issues with pinning down Brum’s fuzzy edges in other areas of life: working with Jez on the Birmingham Music Archive; my current main project at BCU, working solely with “Birmingham” based businesses; and hanging out with a load of Brummies in Guernsey one summer who turned out to be from Kidderminster but found it easier to say they were Brummies. I’ve also had the pleasure of trying to work out a local news patch, bringing these boundary disputes down to a true “hyperlocal” level. The way in which we conceptualise Birmingham as a place and Brumminess as a cultural identity are fascinating. We have a strange relationships with our borders and boundaries – there are all sorts of reasons why (local historians, please do add these to the comments), but one thing is certain: in the spirit of Godwin’s law, if you mention “Greater Birmingham” or drag up the second city debate, then you lose any Internet argument by default. Posted on November 3, 2009 Categories UncategorizedTags birmingham, masocialmedia, socialmedia, statsLeave a comment on Who does the most social media? Some data. Maybe. I took two groups of our BA students around Birmingham this week. Our mission: to find where the creative industries hang out, and to think about how design lives and breathes in the real world. We spent three hours and covered a lot of ground. Unfortunately we didn’t get as far as Ikon at Brindley Place. I have left this map open, so please feel free to add to it. The students will be uploading photos and thoughts on the trip to http://www.flickr.com/groups/mc436oct08/ over the coming week. If you have any thoughts then do share with them! The project was in part inspired by Stef Lewandowski’s creativity audit (http://www.steflewandowski.com/2008/09/a-creative-director-for-birmingham/ ) and in part by loking at Birmingham Flickrmeets (http://www.flickr.com/groups/birmingham_flickrmeets/ ).